AMD has launched its Llano APUs, officially called the A-series processors, today. The Llano APU architecture is targeted at mainstream laptops, all-in-ones and mainstream desktop PCs, and there should be stock of such PCs for sale as you read this. The main improvements from this full-fat flavour of combined CPU and GPU are increased battery life (by over 50 per cent) and some new GPU-powered capabilities. However, as predicted when we first heard about AMD’s plans for Llano eight months ago, the A-series APUs will built around a K10-architecture CPU. ‘Llano uses a 32nm updated version of the 45nm Phenom II x86 cores. It offers IPC enhancements and a larger L2 cache, as well as power optimisations,’ AMD's product marketing director John Taylor told us. When we asked exactly what these IPC enhancements involved, we were told that AMD had ‘made several enhancements, such as an improved IP-based hardware prefetcher, bigger window size (larger reorder and load/store buffers), a hardware divider and so on.’ When combined with the extra Level 2 cache, these improvements should increase performance by a few per cent. 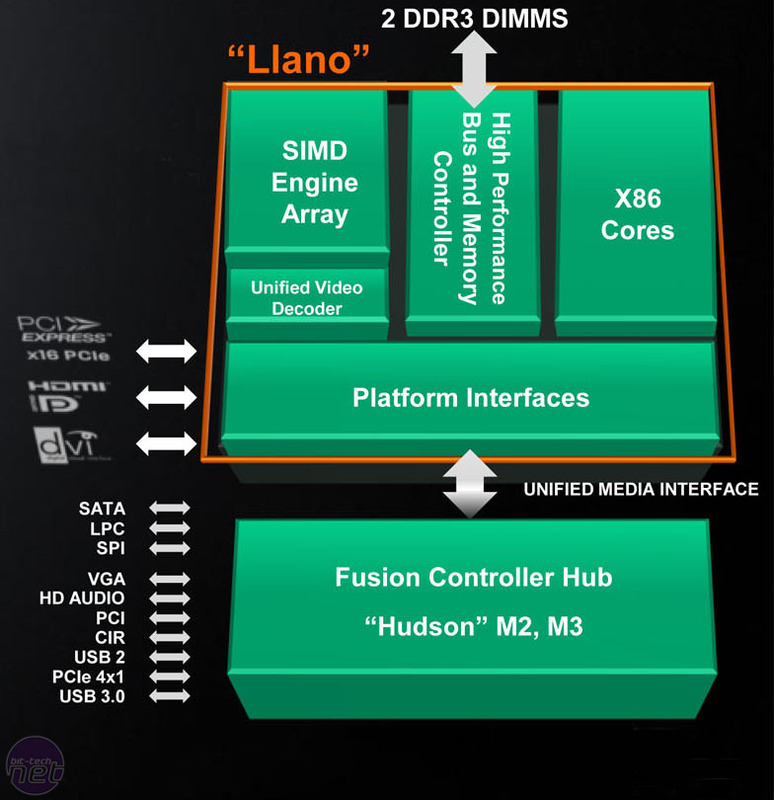 The tweaks and process shrink are denoted by AMD's ‘Husky’ codename for the architecture, so a Llano APU contains between two and four Husky cores. The purported battery life saving is the most significant advance for laptops from A-series Llano processors, as AMD has suffered from a poor reputation in this regard for years. AMD is claiming that an A-series laptop can deliver over 50 per cent more battery life than an equivalent laptop based on the company's previous-generation technology. According to Taylor, this comparison is made with AMD's 2010 Danube platform, which features a quad-core CPU and an IGP on the motherboard. As such, it doesn’t look as though AMD is making unfair comparisons by comparing its new technology to a laptop with a discrete graphics chip. What's more, the purported battery life improvement hasn’t been achieved by just using aggressive power gating when the processor is idle. ‘We expect to see a battery life advantage at both ends of the spectrum,’ Taylor told us, which means we should see improvements whether the laptop is idle or working hard. It’s here where the advantages of integrating a Northbridge, chipset and graphics unit onto one CPU-like silicon die come to the fore. For years AMD and Intel have been refining the control they have over powering certain elements of their CPUs, first with clock gating (stopping transistors switching when they’re not being used) and then power gating (turning them off altogether). Beyond power gating, the big improvements in power management have come via increased granularity in the control – the ability to divide up the die into many small areas means that more of the die can be turned off at any given time for a given workload. Bringing that level of control to the newly integrated parts of Llano is the reason why Llano A-series laptops should survive for longer away from the mains. Some other improvements have been included too – the DX11-capable GPU brings some GPGPU capabilities that haven’t been seen before. As well as using the Vision Engine to improve video playback quality and take the processing load from the CPU, there’s Steady Video. This takes some of the shake out of a video that you’re watching (it’s not an image stabilisation technology for video you’re capturing or editing), which could be handy for home movies from the family or wonky YouTube clips. You can enable or disable Steady Video via a little icon in the lower portion of the screen. Meanwhile, the new Hudson-based D3 FCH chipset for the A-series processors supports up to four USB 3 ports, along with support for 6Gbps SATA and 16 USB 2 links. The graphics component and chipset also support wireless display technology, enabling you to beam a picture to a TV or projector rather than mess around with cables. This has already been demonstrated via third-party technology from ViVu, but AMD is also working on its own system with another third-party manufacturer. This will require a receiver dongle for the destination display device and is due for release in the next few months.